These days, with “Narcos” on Netflix and “Loving Pablo” in theaters, South American drug stories are a dime a dozen — or, maybe, 10 bucks a bag — but you’ve never seen one like “Birds of Passage,” a visually stunning and often surprising true story that charts the rise of the Colombian drug business back before Escobar from its unexpected roots, among an indigenous clan in way over their heads. Matching its artistic vision in anthropological value, this fresh take on a familiar genre — told from the point of view of the country’s Wayuu people — marks an ambitious follow up to the Oscar-nominated “Embrace of the Serpent” for helmer Ciro Guerra and his wife, producer Cristina Gallego. Over the course of four features together, Guerra and Gallego have gone a long way to represent native experiences otherwise undocumented on film, but “Birds of Passage” marks the first time they have shared directing credit — perfectly fitting for a film where the female characters hold real power over the men. Here, local matriarch Ursula Pushaina (Carmiña Martínez) emerges as the film’s strongest character, like the indigenous equivalent of Catherine Zeta-Jones’ “Cocaine Godmother.” “Do you know why I am respected?” the imposing character asks her future son-in-law (Jose Acosta) early on. “Because I am capable of anything for my family and clan.” By the end of the film, we’ll see just how far she’s willing to go. Acosta plays a cocky young bachelor named Raphayet, who makes it known that he’s interested in marrying Ursula’s daughter — and newly eligible bachelorette — Zaida (Natalia Reyes) at a dazzling Wayuu courtship ritual known as the yonna, a traditional dance in which a woman, wrapped head-to-toe in a billowing red blanket, chases her male partner while making exaggerated bird-like movements. This is but one dimension of the film’s title, which hints at the superstitious significance the Wayuu put on their avian companions — a recurring motif throughout the movie, as human characters look to the winged creatures as a kind of omen or spirit at various points. Locals also use the expression “birds of passage” to describe the drug runners who come and go like migrating species, looking out only for themselves, and leaving serious damage and violence in their wake. Although the Wayuu live in Guajira, a resource-rich desert region in northern Colombia, they don’t benefit from the local mining and commercial interests. Instead, the Wayuu fend for themselves, much as they have for centuries before the alijuna (or outsiders) appeared, drawing arbitrary borders and imposing rules that have little relevance to the indigenous population. Longstanding tensions between the natives and newcomers make it easy for the Wayuu to justify breaking laws at the alijunas’ expense — as Raphayet does by agreeing to help a couple of U.S. Peace Corps volunteers (hippies with no idea the damage their desire for weed will wreak on the native community) score a bunch of marijuana, counting on the errand to earn him enough to afford Zaida’s dowry. In fact, it pays so well that Raphayet and his buddy Moises (Jhon Narvaez) go into steady business selling marijuana to the Americans — though never anything harder than grass. That doesn’t seem to be an issue for Ursula or any of the family members until Moises goes rogue in the middle of a deal and shoots a couple of foreigners. Listening to the English-speaking actors’ stilted line delivery, one realizes that the film is better cast than it is acted, pairing professionals in the lead roles with a memorable ensemble of toothless and sun-ravaged amateurs, whose eccentric looks and slightly awkward body language serve to distinguish the film from more generic drug opuses. Composed as five discrete chapters over the devastating two-decade stretch between the 1960s and ’80s — a period known as “la Bonanza Marimbera” when narco trafficking thrived in the region — “Birds of Passage” holds its own as a mythic addition to a seemingly boundless canon of drug-trafficking tales, fueled by violence, avarice and the constant threat of bloody reprisal. This epic tragedy begins from a place of naive innocence and builds to a full-blown war between two rival factions, and yet, Gallego and Guerra construct the film with such a deep interest in and respect for the indigenous culture that the drug element is but the window through which they view this endangered way of life. Marijuana may as well be a metaphor for any outside influence on such an enclave, as the filmmakers use the high-stakes business to demonstrate how modern temptations of all kinds threaten to pull the Pushaina clan away from their ancient, honor-driven system of customs and rituals. 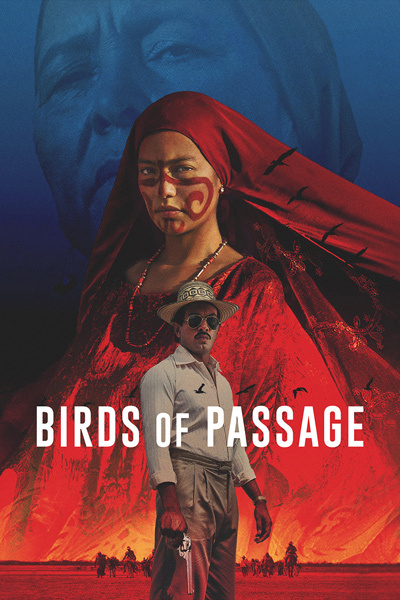 Few films have captured quite so powerfully the tension between the old and new worlds — a feat “Birds of Passage” accomplishes while simultaneously allowing audiences to channel the Wayuu’s surrealistic view of their surroundings, where spirits walk the earth, and wise women interpret their dreams. Whereas “Embrace of the Serpent” luxuriated in period-appropriate black-and-white, “Birds of Passage” practically erupts with color. Coupled with an immersive sound design — in which a steady background of insect noises blends seamlessly with the otherworldly vibration of unfamiliar instruments — the super-saturated visuals give the entire experience a heightened, hallucinatory quality, as if fellow South American director Alejandro Jodorowsky had applied his trippy sensibility to something of genuine ethnographic significance. South-of-the-border drug stories may be nothing new, but this one stands apart, taking on an almost folkloric dimension as it tracks the potential demise of an entire people.